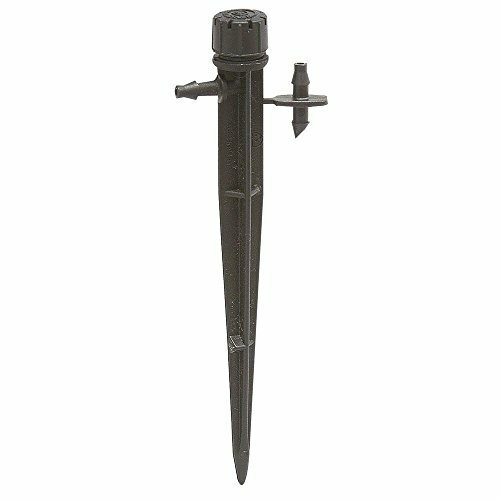 DIG 360 Degree and 180 Degree Adjustable Stream Drip Emitters, combined with 6" stake and 1/4" barb are designed to produce a gentle stream pattern with adjustable flow rated from 0 to 15.7 GPH and a diameter range from 0 to 2.7' at 30 PSI. Models B05B (pack of 5), B10B (pack of 10), and B25B (pack of 25) come with 1/4" barb and produce a full circle pattern with eight streams. Models BA1B (pack of 4), BA10B (pack of 10), and BA1PRO (pack of 25) also produce a full circle pattern and come with 6" stake. The half circle models include B10C (pack of 10) with 1/4" barb, and BA5C (pack of 5) with 6" stake. Each 360 Degree and 180 Degree Adjustable Stream Drip Emitter has an adjustable cap that allows for simultaneous control of the flow rate and the wetting area. Useful in residential gardens for an individual plant or group of plants, inside planter boxes and small to large pots, or for groundcovers, shrubs, and trees, the Adjustable Stream Drip Emitters offer a convenient way to water areas where conventional sprinkler systems are not workable. If you have any questions about this product by Dig, contact us by completing and submitting the form below. If you are looking for a specif part number, please include it with your message.